We got up at a leisurely quarter to eight and with a lovely display of the sun burning through the mist. Packed the last few items in the camera bag and suitcase. Zipped up both with the usual prayer that whatever forgotten will not turn out to be important. Had a great breakfast of fresh grinded coffee, homemade bread and pineapple, not a bad way to start the first day of our Adventure on the Greenlandic East Cost Louise and I are equally excited and chats energetically about the adventure and what to expect. 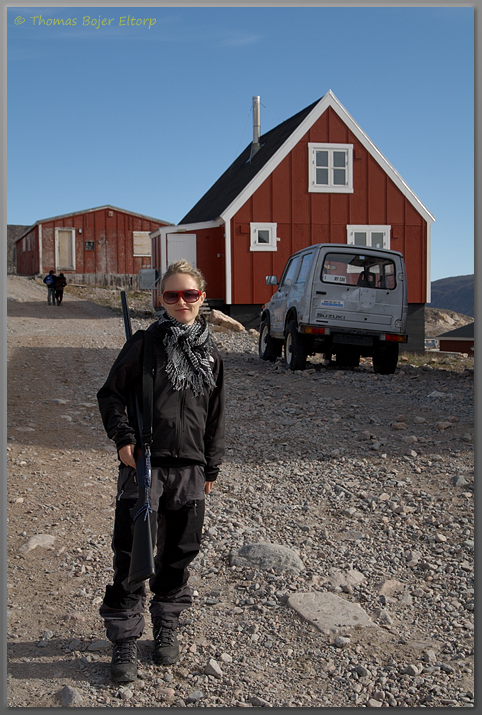 Louise has spent 3 weeks in the Tasiilaq area before, but it will be my first visit to the Greenlandic East Coast. 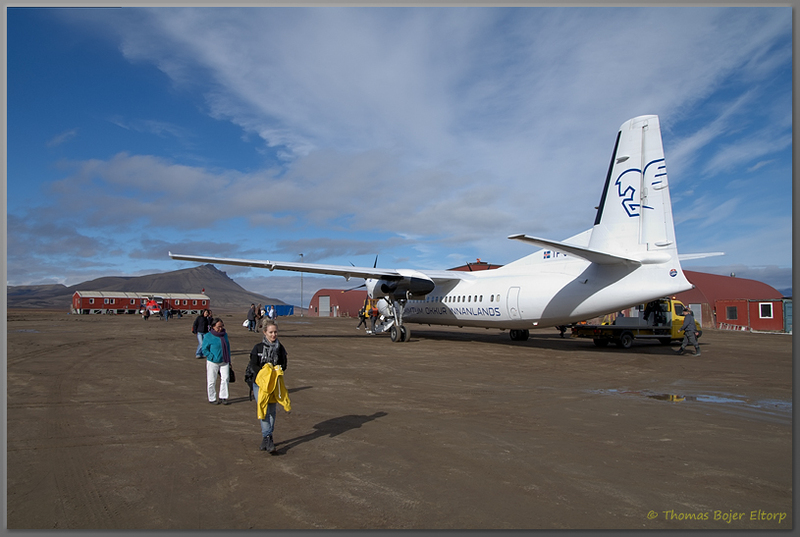 We are off to the airport and just before Noon the brand new Air Greenland Dash 8 streaks into the sky and we are on our way to the small settlement Kulusuk, essentially a dirt runway and a tiny settlement of hunters. 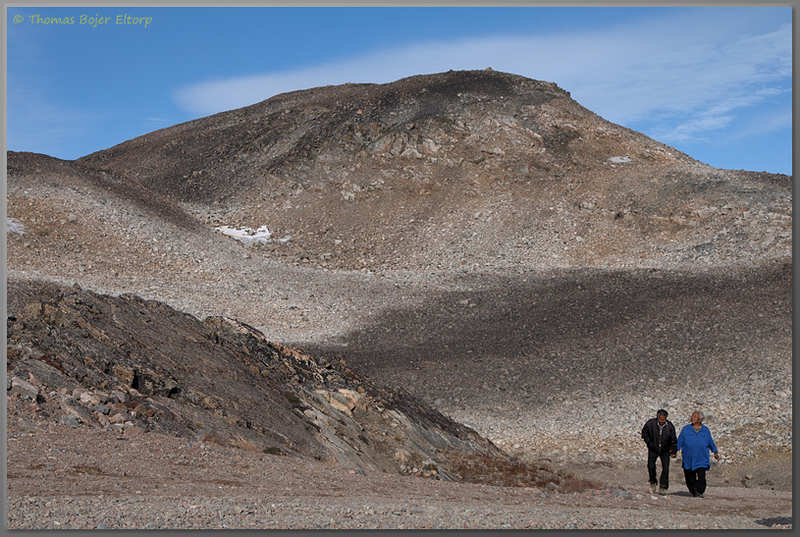 From here a helicopter will lift us the last 15 minutes to Tasiilaq. The trip over the Greenlandic Inland Ice is dull, a thick cloud cover just below us and nothing to see, but a very smooth flight with excellent service from the efficient Steward. The decent to Kulusuk takes us into some heavy rain and wind, but nothing unusual for Greenland. The small terminal building is packed with people, but somehow the staff manages to make everyone more or less at ease and keep people in a good mood. I was really impressed by them. We are booked on the last helicopter to Tasiilaq and as the hours run by, the Bell 212 airlift people to Tasiilaq in a Steady pace. at shortly before 5 in the afternoon the last helicopter takes off ferrying the two us and one of the Airport workers home to Tasiilaq. A foggy but smooth ride between misty, tall and dagger like mountains towards the Airport in Tasiilaq. First sight greeting us is the dump yard and it really hurt our eyes to see this beautiful landscape littered with garbage spilling directly from the junkyard and into the fiord. Granted, the rain does not make it any better, but to my untrained eyes they seem to have some environmental protection issues to address. Arrival at the airport shows the familiar colourful houses and the tiny heliport where an A350 helicopter is parked. We are picked up by a guide or guest house worker from "the Red House" one of the local Bed and Breakfast in the settlement. We drag out luggage through the pouring rain up the stairs and into the main area of The Red House. "DANGER! – POLARBEARS! - PLEASE ASK THE STAFF BEFORE LEAVING THE RED HOUSE!". A fair reminder that we are in an area where polar bears sightings has gone from nearly non existent to common in just a couple of years. Here we are shown to our room, the size of a walk in closet and told that dinner is 220DKK for the four course traditional menu (nothing else to choose from) and that Breakfast is at 8:30 the following morning. A quick install in the "walk in closet" We decided that our weatherproof jackets should be more than enough and off we are, into the rain to catch the first glimpse of the settlement of Tasiilaq. Louise is somewhat prepared, but I totally adore the settlement, even in pouring rain, it is an adorable mix of apparent weatherworn houses, the occasional sled dog, children playing in the rain. It just seems so Greenlandic to me. There is a but though, the entire town seems very dirty and with litter all over the place and that is likely something that will put a dent in my adoration of the settlement. I use my small waterproof Point and Shoot camera (thank you Pentax) to capture the first outlines of images I plan to shoot the following day that should be dry, but overcast. We returned an hour later in time for dinner, but totally soaked. A towel and a quick change of clothes later we are ready for the traditional dinner. A dinner that, in so many ways, lives up to an impression of being in a settlement where things taken for granted in the civilized world simply does not exist. Tired from a long journey we decide to head the bunk early, with our cup of sweet chilli tea number 200 of the day and a hopeful prayer for better weather on day 2. Travelling is bliss and waking up in a walk in closet at 8:15, finding just enough time for a morning kiss from a beautiful woman and a brush of teeth, before breakfast is served is really an amazing way to start a new day. The weather is not so amazing though, rain is pouring down on a morning where it was supposed to be dry and cloud cover is low enough to hide any sign of the pointy peaks around us. Breakfast though is decent enough, drinkable coffee, freshly baked bread with jam and cheese. Topping off breakfast with a cup of sweet chilli tea is not bad either and helps us prepare for a day outdoors in rain. Now the rain is not necessarily a bad thing. 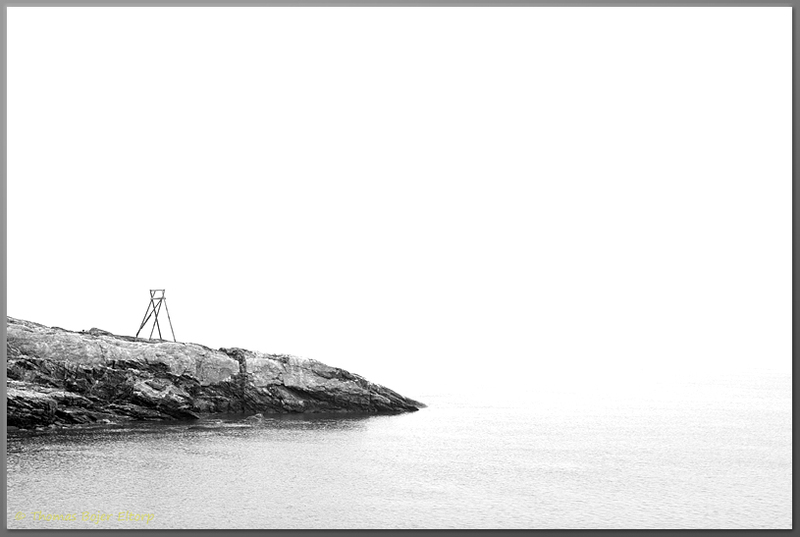 From a photographic point of view it helps create the perfect mood for the images I have planned to shoot. A blue sky and sun would not have allowed for the same images. A weather sealed DSLR and Lenses, makes capturing these images trouble free. 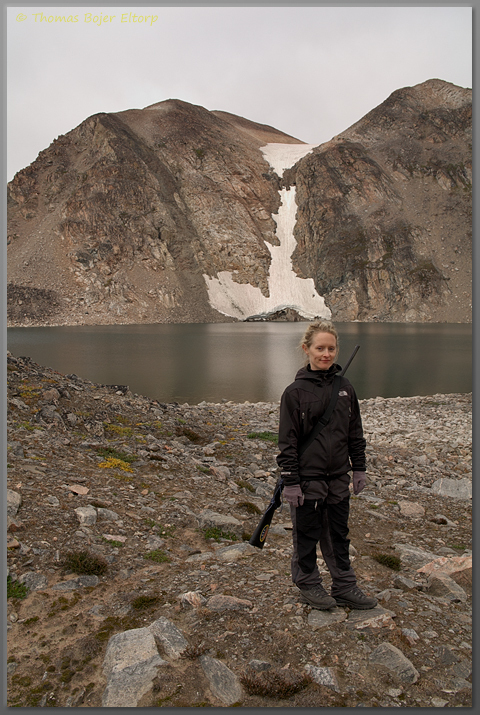 We dress up in Gore-tex shells from head to toe and start out from the Hostel. Everything is wet and worn, but the images slowly start to flow. We walk passed things that looks like they were invented and used half a century ago and slowly makes our way towards on of the small grocery stores and even on a rainy Sunday they are open. I saw the most expensive water melon I have ever seen - 10 EUR. What is not amazing is the fact that my jacket is not really weatherproof and the poncho I use as back up starting soak too. Bad news on a rainy day, we start looking around for a new shell. Destination EastGreenland the local tourist agency has one, but not at a price I am willing to pay. 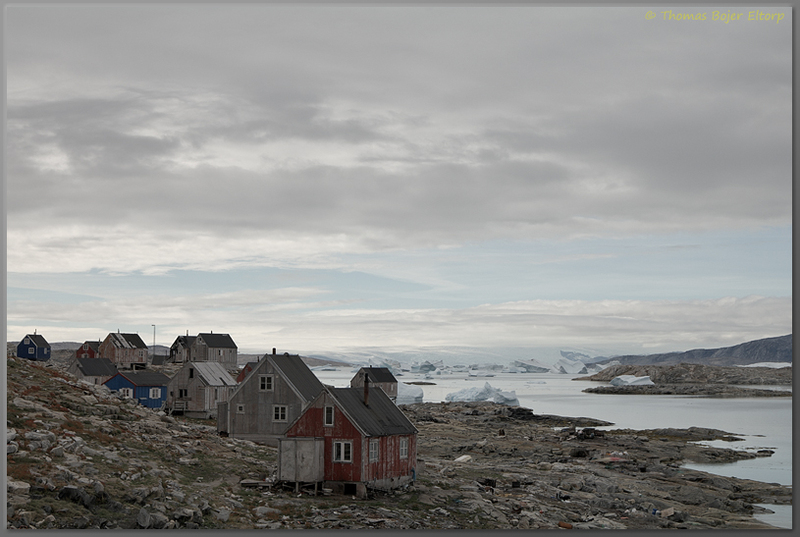 We spend the first half of the day walking the settlement, taking in how life is in the more remote areas of Greenland, I feel like being set back to somewhere in the 50ies things are old and worn. In many ways this settlements start to look more like a 3rd world country site than part of the Greenland I have seen on the west cost. However nearly everyone greets us with friendly smiles and chatter. As the poncho begun to get soaked and take in water, we decided to do a walk up to the only real Hotel in Town the Angmassalik Hotel (Tasiilaq used to be called Angmassalik in the past).They would not allow us to dine in the restaurant as we did not stay there, but the hotel had a clothing store where i wa able to find a new hard-shell, a pleasant surprise that really saved the day. Now dry and with a weatherproof jacket again, we walked to the grocery store and bought some food for lunch and dinner. Back at the hostel, we prepared a quick lunch and a large pot of sweet chilli tea. After Lunch and a nap, we donned the weatherproof clothing and hit the settlement for another rainy walk. The walk back was uneventful and rainy, but we new that there would be a pot of smoking hot sweet chilli tea waiting at the hostel and that helped the mood a lot. I had the images I intended to shoot for the day. We prepared a light and late dinner of Pasta, frozen veggies and tomato sauce before heading the bed to the sound of heavy rain pondering the roof and windows. Again with a smile on our faces from the adventures of the day - not to mention a prayer for better weather. We woke up late on this Monday morning and had a look out the window. A moderate gray, but unlike the previous mornings the window was not streaked with water. We got up, grabbed a shower and a quickish breakfast. Before starting the day with a visit to the "big" supermarket in the Settlement, like in all settlements it is called "Pilarsuisoq" and is part of the KNI Group. The lower floor had groceries and food and we found it fairly well stocked, or at least better stocked than expected. Only the Fruit and Veggie department lived up to the settlement reputation, a total of 5 oranges and 4 water melons in that area, the latter priced at just above 10 EUR. Having done our shopping we strolled back home through town, donned hiking boots and in my case grabbed a camera bag and hit the road. Our destination was the Flower Valley and the lakes and waterfalls behind the settlement. Now as we left town, a local shouted us off a dog yard that we unintentionally was about to walk into, the trail led us past the most gorgeously located cemetery and a moment later we were in the area called Flower Valley. 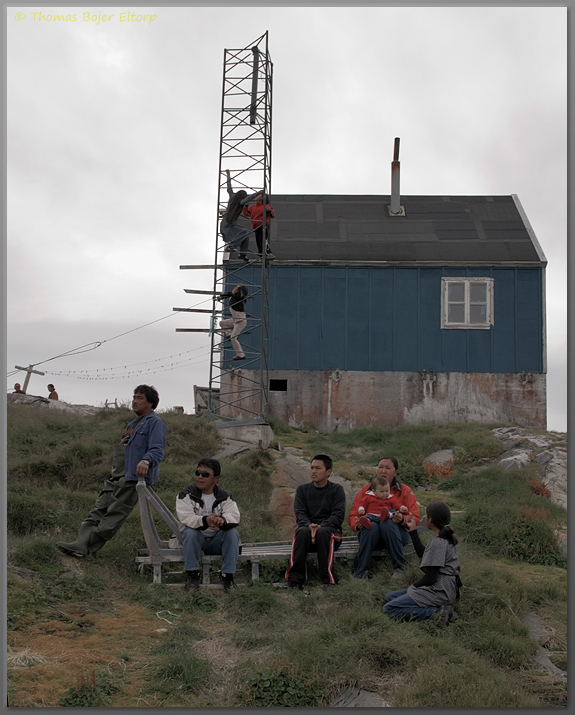 The area itself is fairly small and by Greenlandic standards extremely fertile. Flora is more dense and colourful than I have seen anywhere else in Greenland. However it has to be seen and judged in relation to Greenland to make sense, by most European standards it is not as fertile as I seem to describe it. We exited the valley and followed the trail along a series of small rivers. A local family was fishing trout and apparently doing so just by plunging a hook in the river and wheel in a fish. It seemed so easy that even I would consider giving it a try. We reached the most gorgeous little waterfall and with a gorgeous boulder right next to it. The rock totally solid, with excellent friction, I was able to boulder a fairly difficult route 5 meters up in heavy hiking boots. I would have loved to have my climbing shoes at hand there. Best boulder I have had this year. This area has some way better than average climbing and bouldering opportunities. I spend some time shooting images of the Waterfall and the flowers, the total lack of wind made for some excellent and normally impossible compositions. After a while we pushed on and came to another stunning lake water pouring in over a waterfall so beautiful it looked landscaped, definitely one of the most beautiful lakes I have seen. I set up a tripod, but had to take it down as a downpour passed us. We hiked above the waterfall and stood looking at the hundreds of fish breaking the surface in the lake above the waterfall. As the downpour stopped we walked back and I managed to set up and get my image as a light rain graced the lake, most beautiful I think. While I messed around getting above image in the bag, Louise had a ball picking blackberries and “sortebær”. We decided to hit back to the hostel, for an afternoon snack and a run in the settlement. As we strapped on our running shoes the sun broke through the clouds setting a perfect scene for an evening run. And what a tough 8 kilometre run, I thought Nuuk had hardened my skills in steep hill running, but Tasiilaq really made a show for the money. I was ready to throw up as I rounded the water pumping station and started back downhill, while not as strenuous on my lungs it was rather difficult to maintain control while running down. Returning to the hotel we found a rock where we rested for an hour and enjoyed the gorgeous sunset. We hit the beds sleeping after a long and amazing day. "BEEEP - BEEEP - BEEEP!" – Good morning time is now 0700 hrs and it is Tuesday, Nobody likes the sound of an alarm clock during a vacation, but in this particular case neither of us disliked it. 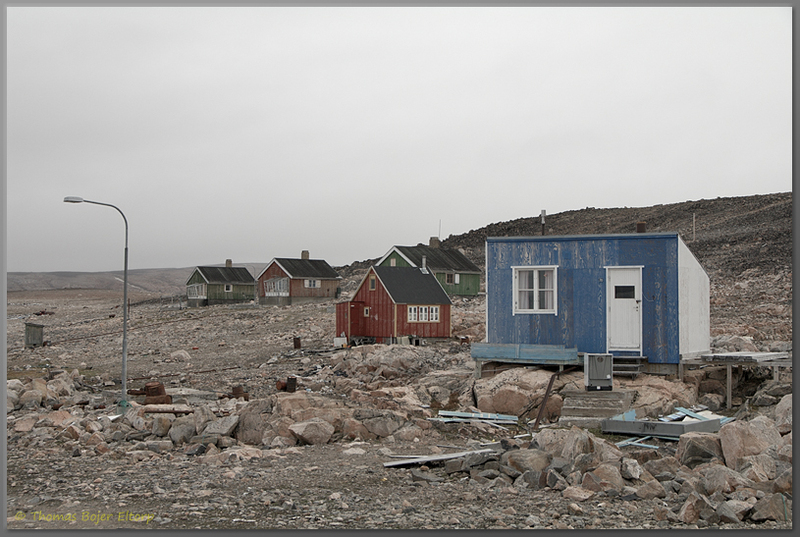 Today was the day of our visit to the Settlement "Isortoq", one of the most remote settlements in Greenland and probably in the world. We got up quickly, showed and prepared a hot müsli stew for breakfast, donned our gear and grabbed the prepacked daypack and camera bag, before heading for the harbour. Here we boarded the local cargo liner sailing supplies the 5 hours to the tiny settlement, it only does this route twice a week during summer and only if the sea ice allows passage to the settlement. 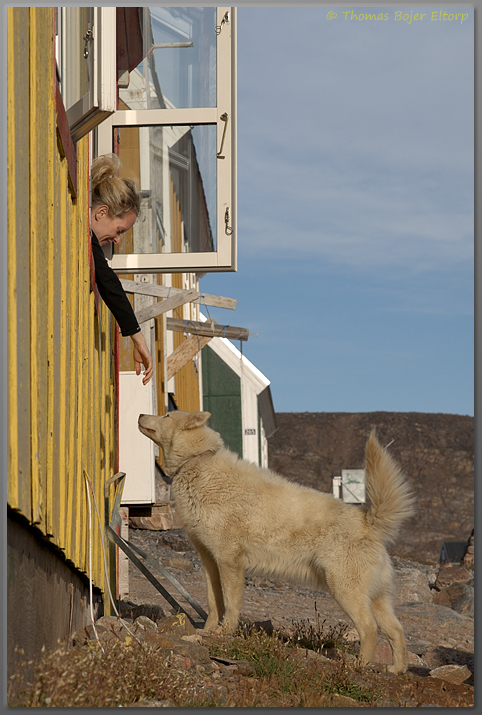 We were greeted kindly by the crew, speaking only Greenlandic and a few syllables of Danish. And for the next five hours we sat there watching the crew work the ship through a massive ocean filled with huge icebergs from the Northern Ice sheet. Several times on our journey we are greeted by the “SWOOSH” of humpback whales breathing air and following the ship for a little while. 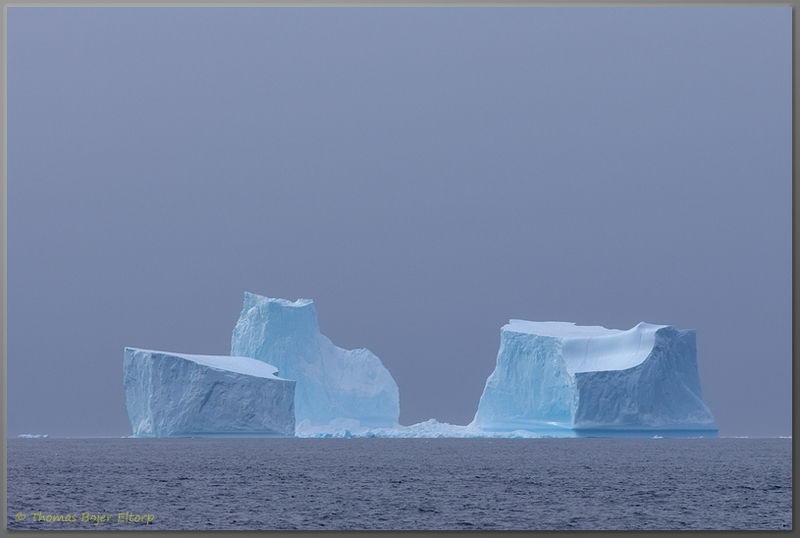 Amazing how lucky one feels sailing among icebergs and with the sight and sound of humpbacks following the same route. 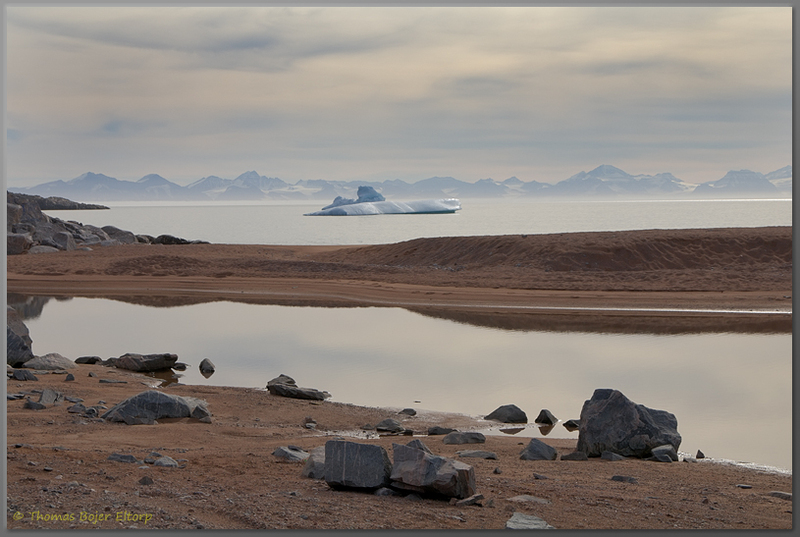 Finally we arrive at a barren and flat Island among huge icebergs and with a massive glacier glooming in the distance. This Island is the definition of solitude rough nature. It just feels remote in a way I am unable to describe and likely influenced by the journey to get here. The settlement is home to some of the most skilful and hardwearing dog sled drivers and hunters in the world and it shows on the inhabitants, they look like people living at the end of the world and working hard just to stay alive, but still the children greeting us, looking at and touching Louise's blond hair seems so full of joy. The house looks like they are in a constant struggle between being maintained by the people living there and destroyed by the forces of nature. 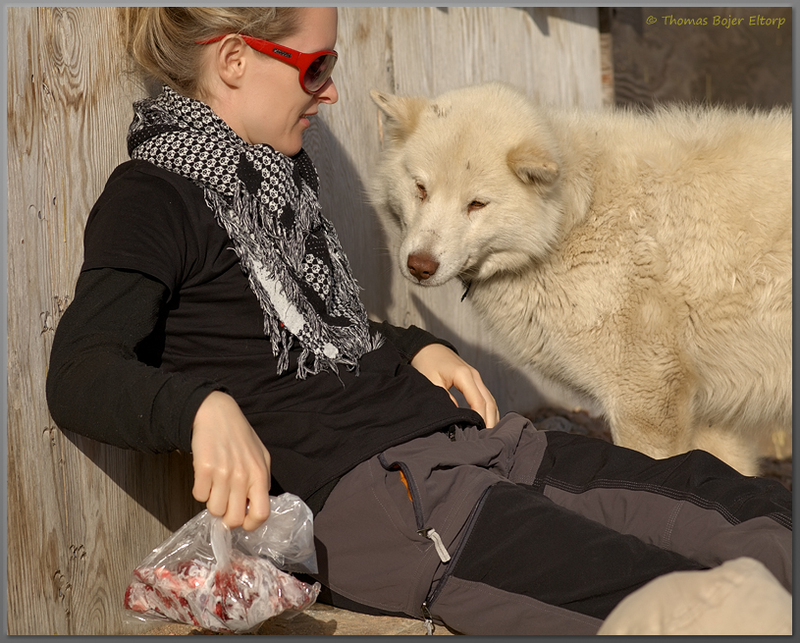 Even the sled dogs here look more hardened and tough than sled dogs elsewhere, more lean and fierce. 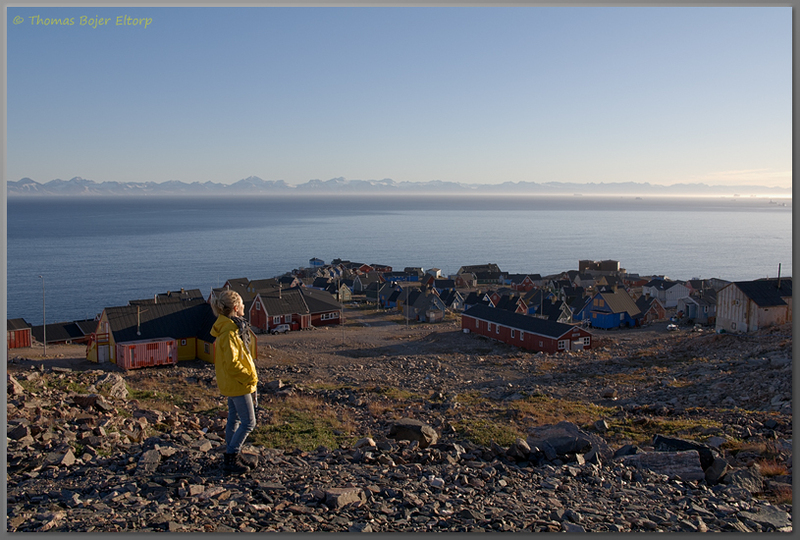 This village is such a contrast between perhaps some of the most difficult living conditions in the world and some of the most welcoming and kind people I have met in Greenland. We are only there for a little over an hour, but it took minutes for this settlement and the people here to make an impression on me that I will never forget. I pray to come back here one day, but to stay longer and learn more about their life. The trip back is another stunning display of the arctic nature and the stunning sceneries Mother Nature are capable of in the arctic regions. We sat back in awe and enjoyed the scenery, 5 hours sounds like a long trip, but with a display this beautiful, 5 hours is only a short trip. Getting back to the hostel, neither of us are capable of anything, but to prepack our bags and the head to bed. This last day in the Tasiilaq region has been beyond words and tomorrow we will be heading North and for the first time arrive in Polar Bear Country or Ittoqqortoormiit as it is called in Greenlandic. Another day where the alarm clock awakes us, but again on travel days such things are of little importance. An early breakfast, followed by a quick check out and then a drive to the heliport where the Air Greenland Bell 212 awaited. I felt ready to leave Tasiilaq, while an amazing place with great potential, the dirtiness of the place still burns in the back of my mind keeping me from being totally sold on the place. Would still love to go back, but it is a place where getting the streets cleaned up would help tremendously. The flight to Kulusuk, was with a light high altitude cloud cover, providing us with a perfect sight to the small glaciers and dagger like peaks, a very beautiful flight. 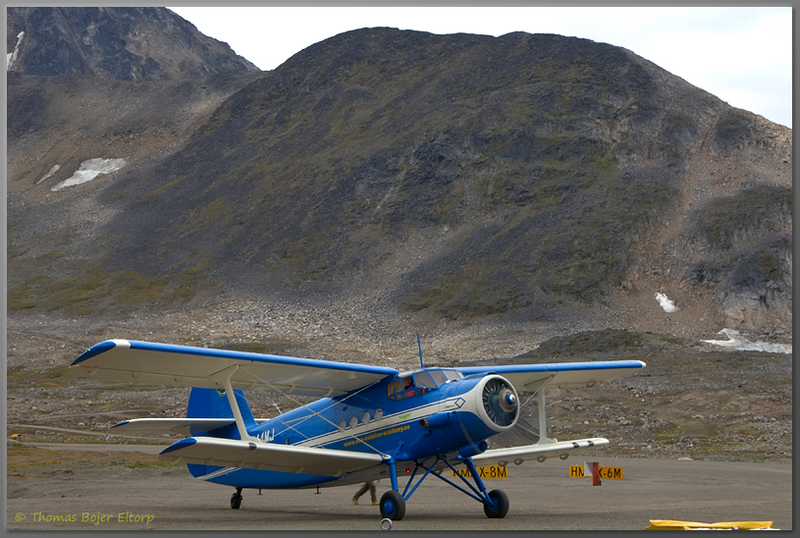 Arriving at Kulusuk we were greeted by a gorgeous biplane that was on it’s way from somewhere to somewhere else. What a beautiful Aircraft. We did not have a very long wait in Kulusuk and an hour later the AirIceland Aircraft took off heading towards our destination - Nerlerit Inaat. A stunning flight with a birds eye view to a multitude of high peaks and huge glaciers, one scenery more stunning than the other in an endless row for two hours. It simply was a magnificent flight and we were blessed with clear skies and the only bump was when hitting the dirt runway in Nerlerit Inaat. The flight in towards Nerlerit Inaat was another out of this world beautiful experience, to see a landscape so barren and so carved by ice was extraordinary, especially with the birds eye view the aircraft allowed. When the flight came to a holt at the apron, we were told to walk directly to the Air Greenland Bell 222 for our flight to Ittoqqortoormiit. A flight that was perhaps even more amazing than the first. Save for my flights around Kangia near Ilulissat then this is perhaps the most beautiful helicopter flight ever. Arrival at the heliport was a new experience. A small levelled hilltop with a gravel road leading down is more correct, no buildings no nothing. We were picked up by Jennifer from the local guest house. We turned down the offer for a ride and walked our way to the guesthouse. The walk sat us back in awe, this settlement is what I can without a doubt call the most impressive settlement I have seen. A view unlike anything I have ever seen. 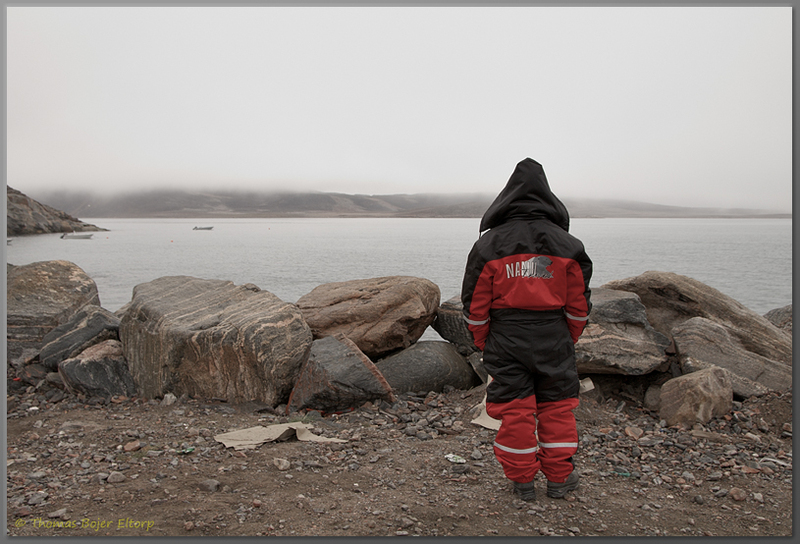 The mouth of the fiord with a size that is hard to grasp distant snow covered peaks and a constant mist playing among the distant icebergs. Both Louise and I were totally in love from the first step of the walk. 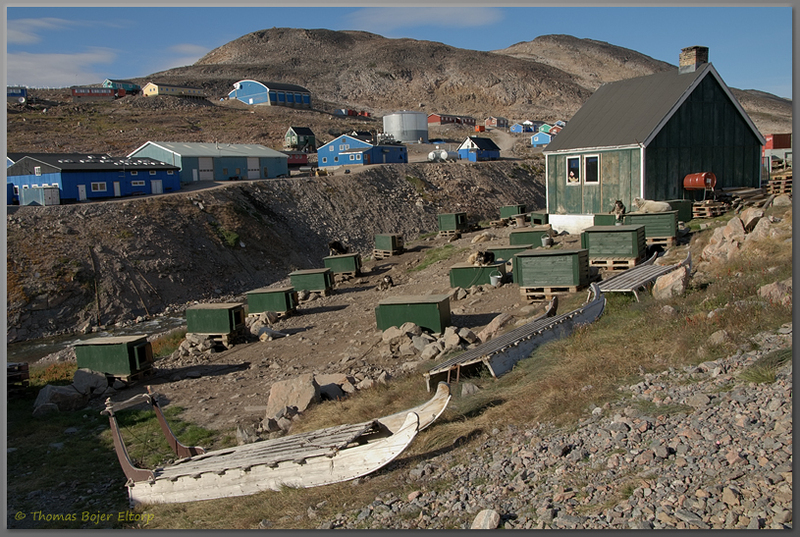 Even though located way up North and the Northern most settlement in Greenland, it seems more organised cleaner and better maintained than Tasiilaq. Our first impression tells us that Ittoqqortoormiit is a place we will return to with absolute certainty. And that the two weeks planned here will only be enough to scratch the surface of this place. As we walk up to the guest house and see Jennifer work her rear end off showing guests around, we are told that she will be with us in a couple of minutes. Two minutes later we are shown to a room of excellent standard and the shared kitchens and bathrooms are of the same high standard. 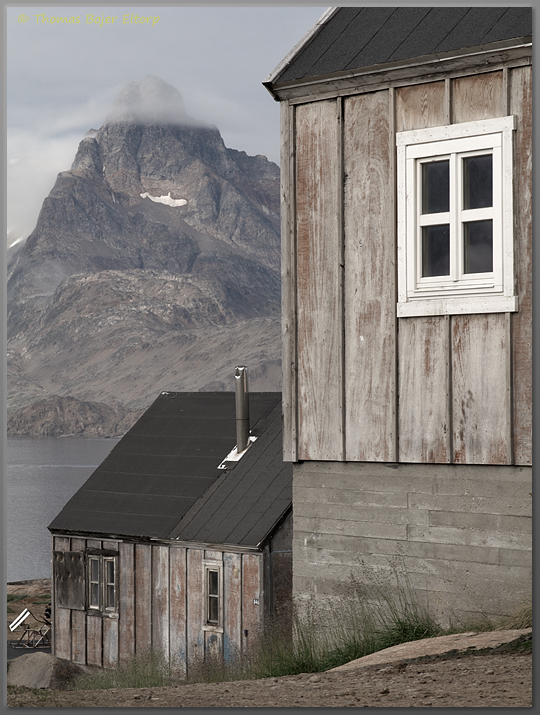 This guest house is of much higher standard than anything we have seen elsewhere in Greenland. Not to mention the first class service provided by Jennifer. We settle in quickly and walks towards Nanu Travel to catch up on our plans for the next two weeks, but they are closed, same goes for the local super market. It may sound strange, but we get the feeling that we are wrong about something, turning on the GPS in my watch confirms it, Ittoqqortoormiit is two hours ahead of the rest of Greenland and everything should be closed. We walk up to a small grocery store and buy some basic food for dinner and heads back to the hostel where we prepare it and enjoy a quiet dinner, while discussing an evening walk. I grab a camera and we head out into the late evening sun. We walk up along the cemetery, where people are more covered with stone than actually buried, simply because there is not such thing as soil in this arctic desert area. It is all rock, ice and water. From here we tour around the settlement for a good hour and the walk confirms our first impressions, this place is very unique and most surprising given where it is located and what we saw in Tasiilaq. We even got to see the fur from a newly shot polar bear hanging for dry outside one of the houses, a very fresh reminded of that we are guests in a country ruled by polar bears and we better respect that and take our precautions. We turn in for the night after a very long and very exciting day, we may not know what tomorrow brings, but both of us feel the adventures awaiting us. Surprisingly enough we woke up early, I went to the kitchen and prepared a breakfast of bread and hot müsli stew served with the usual pot of sweet chilli tea. After breakfast and getting dressed we walked through the crisp and sunny morning air towards Nanu Travel to have a chat with Karina. 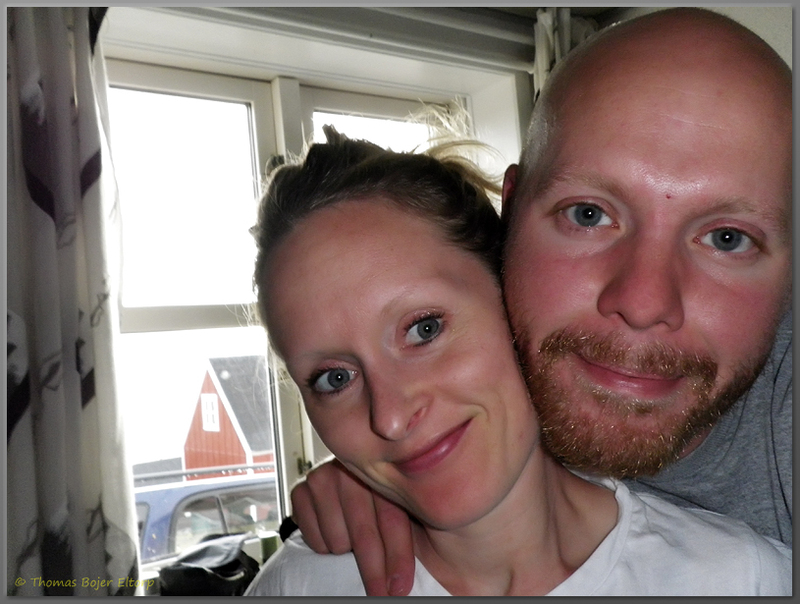 Karina is one of the co-owners of Nanu Travel and has a huge amount of Knowledge on the area and the fiord, thus we have her and her husband Martin assisting us in the planning of our stay. We receive a maybe for joining an Icelandic sports expedition into the fiord from Friday and we are told that they know little more than that they are scheduled to arrive the following day around noon and that two seats should be booked for us, price unknown. Louise gets directions to the home of Theresia, a local woman that produce hand sewn seal fur mittens. We decide to go to the local Pilersuisoq and do some shopping before heading back to Nanu to talk a little about hiking precautions in the area. The Calibre 12 shotgun (pump action type with five rounds in the pipe), that Karina hands over is standard issue for hiking, the alternative is a calibre 30.06 single action hunting rifle, but as we are not there to hunt, but need it for protection against polar bears or to scare away the random aggressive musk ox, the shot gun is more efficient and allow for a faster reload and the Bear slugs provided should be able to put a bear to rest. The shotgun itself was used by her brother when he got attacked by a polar bear. He came away unharmed, so a lot of good karma around this shotgun. I shoulder the shotgun along side a bag of groceries and pocket roughly 20 rounds for it. With a wave and an agreement to talk again the following morning we walk back to the hostel. A quick Lunch and a short powernap later we pack up the camera bag, a couple of thermos and the riffle and heads out towards Walrus Bay, the plan is a lazy afternoon hike, shooting practise for Louise, as she has never fired a shotgun this large before. Seeing Louise with the shotgun over her should makes for a smile, the shotgun is nearly as long as she is tall. However nobody seems to care as we walk through town with a rifle on one shoulder, it is simply common sense here. As we reach the city limit I load up the shotgun and we hit through the dog yards towards walrus bay. On our way to the bay we slowly adjust to the idea of perhaps to meet a polar bear, it takes a little while to adjust and learn to relax completely. Walking an area where other people go regularly makes it a little easier to manage, we meet a couple of hunters and fishermen before reaching the area where we planned to practise shooting tech with Louise. I set up a target, walk back to the bags and shotgun and chamber a round. I bring the shotgun up and release the safety, it falls solid and natural at the shoulder and I gently pull the trigger… A hit:) and wow it felt good to shoot a real shotgun again. Having rearranged the target I hand over the shotgun to Louise, rehearsing the safety practises and basic shooting instructions. The shotgun is almost too big for her to handle, but she does fairly well on the shooting.. Feeling Confident that she too will be able to pacify a bear if needed, we hike to a nearby rock and sit down for our afternoon tea. 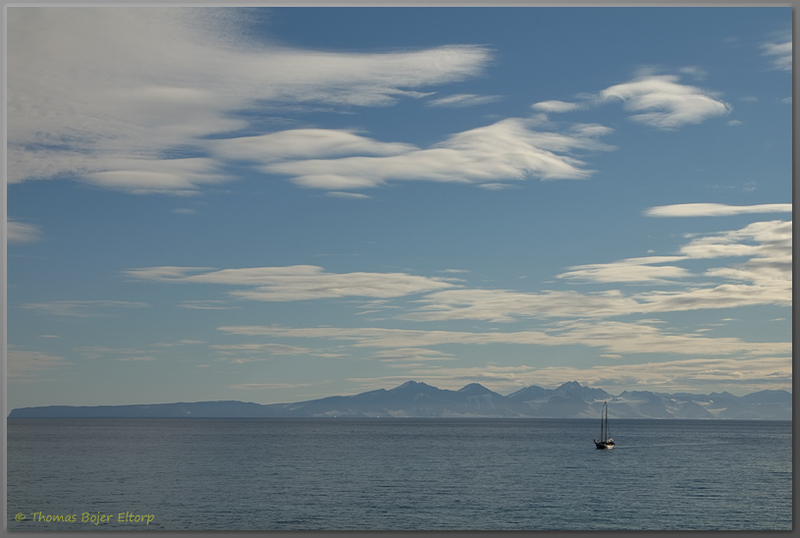 Clouds are forming up on the sky and ice bergs are slowly travelling with the tide and currents of the huge fiord. It is quite simply an amazing view and very peaceful. We are slowly adjusting to the regular scan of our surroundings and the fact that the shotgun next to us is not there for fun. It may sound odd, but we both feel that this carrying a shotgun to protect our selves will become part of our daily life fast. As we are about to break up we see one of the local hunters in the tiniest excuse for a boat I have ever seen (the guy is perhaps 1.5 meters tall and he is barely able to sit in it), rowing towards a bird he has just shot. 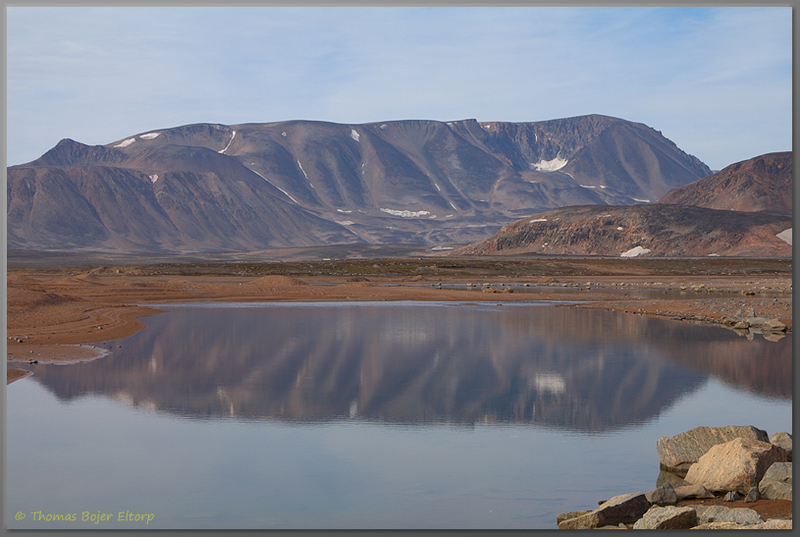 On our way back we run into a couple of fishermen again, but neither bears nor musk ox seems willing to show it self. A slowly emerging discussion is on the opportunities for a much longer stay. Reaching the city limit we unload the shotgun and walks through the amazing settlement towards the hotel. Having the rifle locked up at the hostel, we walk up to see Theresia about the mittens, as we knock the door softer at first and then hard it is opened by a man with a look that yells special forces in the eyes. He introduces himself as Erik and invites us inside to talk to his wife, Theresia. It turns out to be a long visit and the elder couple shares a multitude of stories from their life and families, alongside and in between the mitten talk being done by Louise and Theresia. We hear stories about the 14 children, grand children and Great Grand children. More stories are told about their life in the settlement, the unbearable loss of two children and how they got back on their feet after the tragedies. As we are about to leave from what turns out to be one of the most heart warm visits we have experienced, Theresia walks to the kitchen and returns with a bag of frozen musk ox, she wants us to taste the meat from her latest kill. All in all Theresia and Eric gave us everything and opened their home, both Louise and I was speechless of admiration after the visit. As we got back to the hostel, we sat down outside with a cold beer and just watched people blazing by on ATVs or slowly on foot, we sat for a couple of hours and the talk circled around both a longer stay again and the unexpected kindness and openhearted welcome Theresia and Eric had given earlier. Louise had a very close, but friendly encounter with an almost grown sled dog pup, it quite forcefully insisted on being patted and stroked before leaving. It was quite a fun encounter and kind of confirms that there is more to these amazing dogs than meets the eye. It became a late, very late, dinner, but a decent one and save for washing some clothes we went straight to bed after it. Baffled by the adventures of the day and dreaming of the adventures ahead. Today is supposed to be the day, just after noon the Icelandic ship, we are to join for a five day cruise will arrive and mark the commencement of the most adventurous part of the trip. We know nothing about the crew or the ship itself, except that it is a sports expedition, a test for this Icelandic ship to see if they should start commercial operation and if they are about to cooperate with Nanu Travel. Louise and I will join the ship as test pilots for Nanu Travel. We got up fairly early, went over the stuff we were supposed to bring for the trip, had a very nice müsli and cinnamon stew for breakfast and strolled by Nanu Travel to hear the latest, which was “the ship is supposed to arrive around noon” and we call you then, a further chat on females and shotguns or rifles with Karina and off I was to Pilersuisoq to shot the last bits for the trip. We take a seat in the sun outside the hostel on small rock and for the next couple of hours we are doing nothing besides enjoying the sun and look out over the fiord waiting for our mystery ship to arrive. At 1400 hrs we have yet to see anything that could be our mystery ship and we walk inside and prepare a lunch of black bread and eggs. After Lunch we decide to talk an afternoon walk and allow Louise a bit more shooting practise. We walk out past the junkyard to an area where they have huge piles of gravel, which makes sufficient barricade and allow for some safe shooting, with no risk of ricocheting round. I set up a new target and hand the shotgun to Louise and save for a little uncertainty with the safety and reloading the shotgun, she already starts to look very good with it. And she is getting fairly accurate too. We shoot about 5 rounds before packing up. On the way back we see a ship on the horizon, could it be the mystery ship? We walk to the pier and see this beautiful wooden sailboat approach and she has an Icelandic flag proudly blowing in the wind. She is such a beauty and must be our mystery ship. We walk up to a small grocery store. To walk around town with a riffle and to walk in a grocery store and up to the store clerk with a shotgun on your shoulder and ask for some milk, 25 rounds of calibre 12 and black bread, still feels a little strange. On our way back we stop by the local hospital (Louise is an anaesthetic nurse) and here we are greeted by the local Managing Nurse named Ruth. She is most kind and provides us with a thorough tour of the hospital and an introduction to the staff. A small but seemingly full featured hospital. We decide to dine outside the hostel in the evening sun and while doing so we are passed up, but two rather drunk elder women, barely speaking a word Danish, but very kind and very proud of Ittoqqortoormiit. A most amusing time and the kind and openhearted nature of the locals really make a huge impression on both of us. Jennifer, the hostel manager comes by and joins in. She is such a star. As we have finished our dinner, Jennifer runs up and ask us to come to the Nanu Travel Office to meet the crew of the mystery ship. We hurry down there and meet up with the crew. As we go over the route, potential dangers and underwater reefs and practicalities, it is confirmed that they are excellent sailors, kind and have a good feel for the trip at hand. The ship will set sail at 5 the following morning, thus we hit back pack up the last bits of gear, confirms that we are away from Saturday and will return the following Wednesday. As we go to bed we are barely able to sleep in sheer anticipation of the adventures ahead. Waking up at 3:30 in the morning is definitely no fun, but considering that the next five days will be a cruise into the largest accessible fiord system in the world, helps, that it will be on a two mast sailing ship with seven sails, having been totally reconstructed just a year ago. Her name is “Hildur”, and thus sharing name with two of the family members owning North Sailing. Her home base is in Húsavik on Iceland. On the way to the boat we ran into Ruth a local Nurse, also joining us on this trip into the fiords. We are greeted on shore by Heimir the Captain of the ship, a proud man and as the rest of the crew probably a very gifted sailor, living of the rough weathered coasts of Iceland tend to make good sailors. We were introduced to the boat, the company North Sailing and the rest of the crew. All in all the ship and crew made for a very good impression. We had the owners, their parents, and a lot of other seniors from the company on board, including the guy who rebuild the ship. Our route for day one would take us to Hekla harbour on Denmark Island, with a short stop at Nerlerit Inaat to pick up the senior executives flying in. As we settled our gear and dressed up in waterproof foul weather gear, we studied the forecast and it was not looking all that good and we prepared for the ride of our life. Starting out from Ittoqqortoormiit was fairly quiet, but as we neared the side fiord leading up between Liverpool and Jamieson Land, things started to turn to the worse. 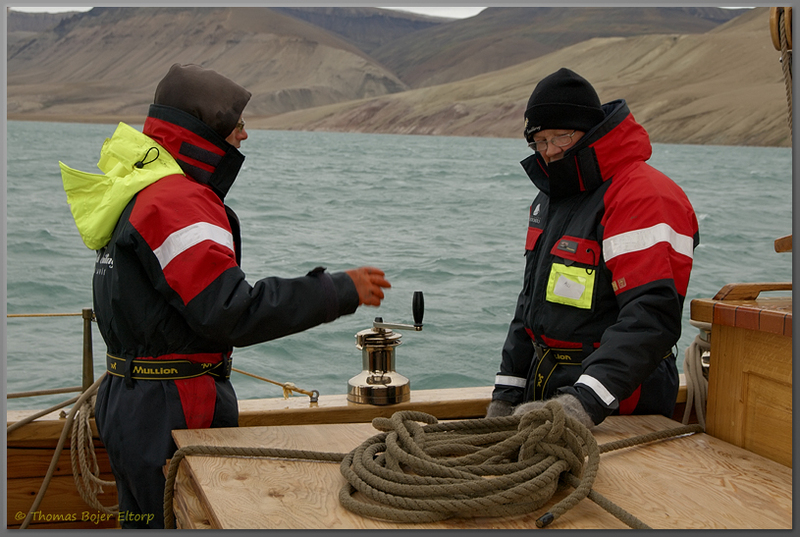 Wind picked up to nearly 30 knots coming straight at us and making it an engine trip up fiord. Waves grew steadily bigger and started to show teeth. The ship handled well though and regularly sent huge sprays of water over the ship soaking everything from the stern to the wheel in the back. As we reached Nerlerit Inaat things quieted down a bit and we managed to load the people, which gave the rest of us a well needed break from the waves. As we set out from Nerlerit Inaat things turned from bad to worse. 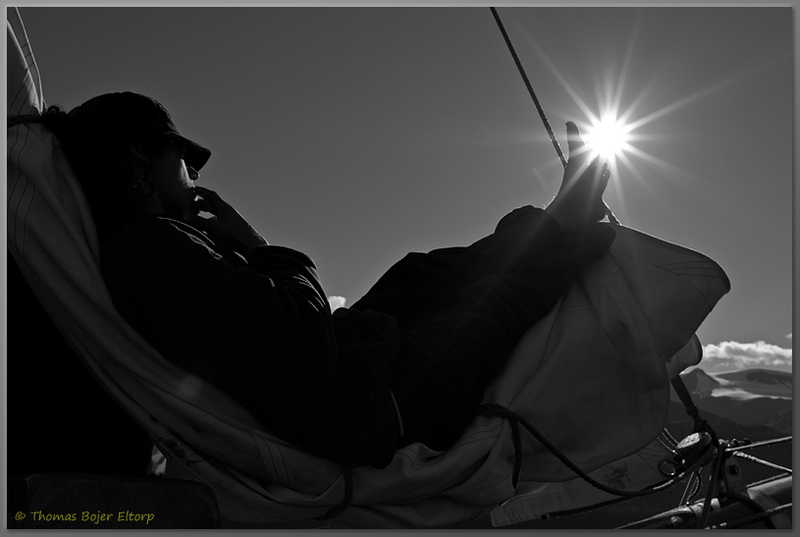 And within 20 miles with the sails up, wind roared from 30 to 40 knots and waves grew huge. It was some very rough ours and quite a lot of seasoned sailors got seasick. As we reached Milneland Island towards Denmark Island, weather turned from roaring to dead quiet and while still heavily overcast, the water turned to mirror like. It made the sunset we saw close to Viking fiord Nothing short of amazing. At around 0300 hrs “Hildur cast anchor in Hekla Harbour and everybody hit the bunks. A very rough and very long day had come to an end and it had been a learning experience for at least a couple of us. As we got up weather had cleared somewhat and we were in this mirror like natural harbour, fairly steep mountain walls and two natural pebbled beaches even in the overcast weather it was an interesting display to take in. 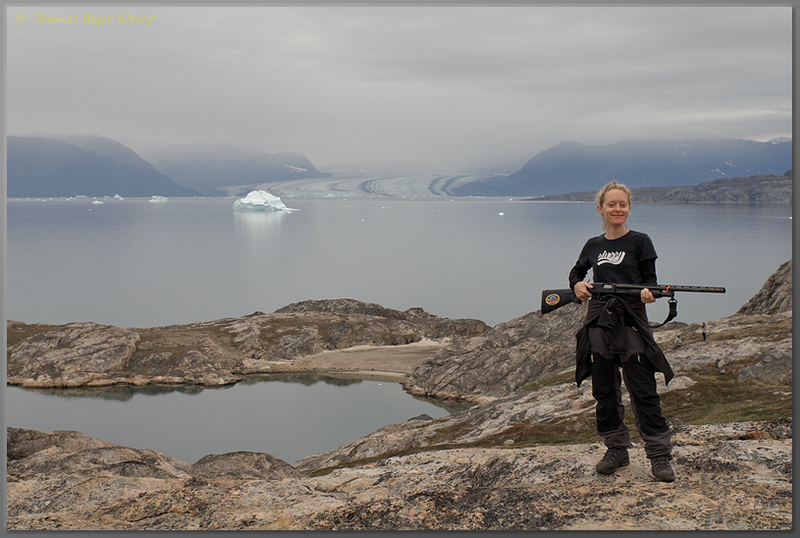 The fiord outside is scattered with Icebergs and across the fiord on the mainland small glaciers run into the fiord. Shortly after breakfast we are in the zodiac heading for one of the stone beaches and two hours worth of hiking. At the beach we load up our shotguns and set of in smaller groups. Our aim for the hike is partly to explore and enjoy the landscape and partly to find a water source. Louise Ruth and I make our own way up the mountains to a plateau, where we slowly get regrouped into larger groups. The landscape is a true arctic desert, with barely any vegetation and nothing but solid weathered rock and the occasional nearly dried out puddle of water. The natural rivers here are all dried out, which makes finding water difficult. Extremely stunning it is though and the photographer in me is a very happy guy. As we get back to the boat, some of the others have found a water source that we can boil into drinking water, so nothing but tea and coffee until we find a better water source. Just after noon we start to pull the anchor (by hand! 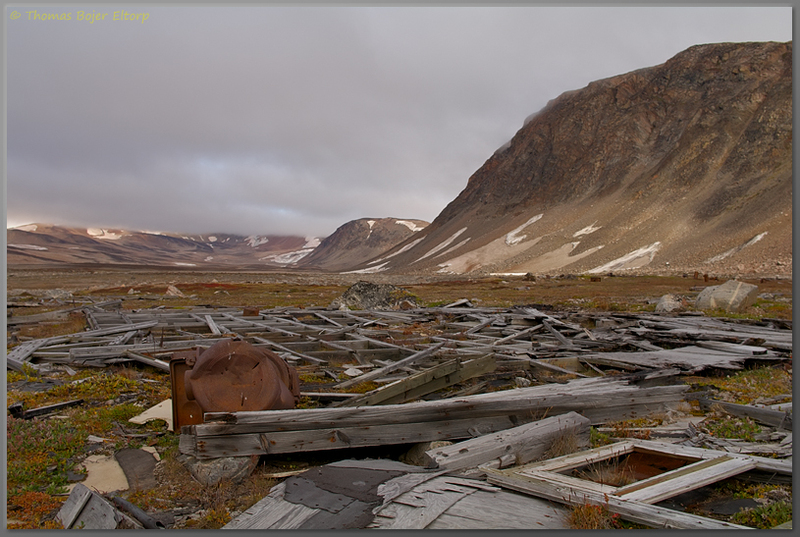 ), what a tough job, but we soon steam out of the small harbour and hit for an international group of scientists where we are to deliver some plywood plates, that we agreed to carry along from Ittoqqortoormiit and to their tent camp at Anchor Bay. On the way there Martin a Videographer, Heimir the Captain and I, grabs a ride in the zodiac to get some images of the Hildur alongside some icebergs and some other stuff, unfortunately not enough wind for the sails to be up, but we have plenty of time for that. As we get back on board they have started working on adjusting the masts, as a newly rebuild ship, it still needs a little fine tuning. It also offers the opportunity to go topside for a nice view of the ship and surroundings from above. The trip up there is fun and hanging from the top of the mast is really good fun too, not to mention an amazing view. Getting used to trust the knobs used by sailors, which are different from the climbing knots I am used to is a little spooky, but they seem to work, so nothing to worry about. The arrival at Anchor Bay makes for a lot of hectic activity at the tent camp, we are apparently making enough noise to be a potential disturbance to the Nar Whales that they want to capture and put tracers on. So the offloading of the plywood and the visit to the camp to learn more about the work they are trying to is done very carefully. The scientists are a mixed group of people from several Denmark, Greenland and Norway, with a common passion for gaining a better understanding of Narwhales and their migratory habits. As the Hildur is stuck until the narwhale time window has passed we decided to bring out the barbeque and enjoy a royal dinner of Icelandic lamp chops, rice, salad and Icelandic lager. Just after midnight we hit the bunks, tired after a long and very interesting day and some sights that are simply beyond imagination. 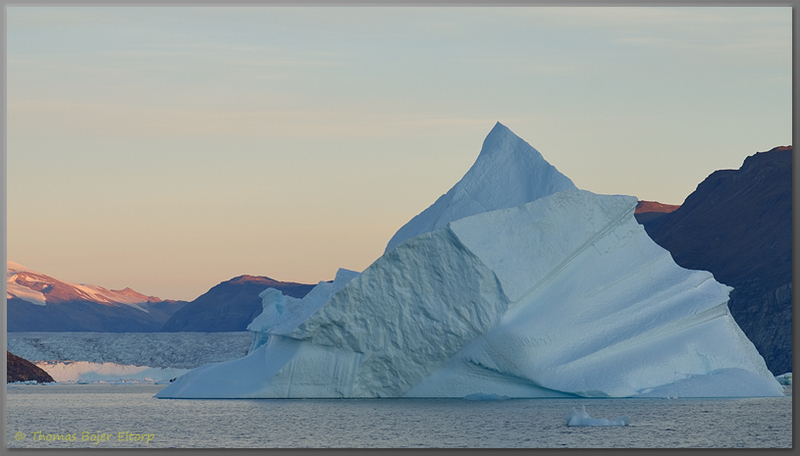 We are woken up by the very loud and very unpleasant sound of a wooden ship gracing an iceberg. I jump out of the bunk and onto the deck to see what is going on. The otherwise excellent Icelandic crew simply forgot that when sailing glacial icebergs you do keep your distance and stay on your toes. Well no leaks and they definitely seem to have learned a lesson from gracing the underwater part of an iceberg the size of a small island. 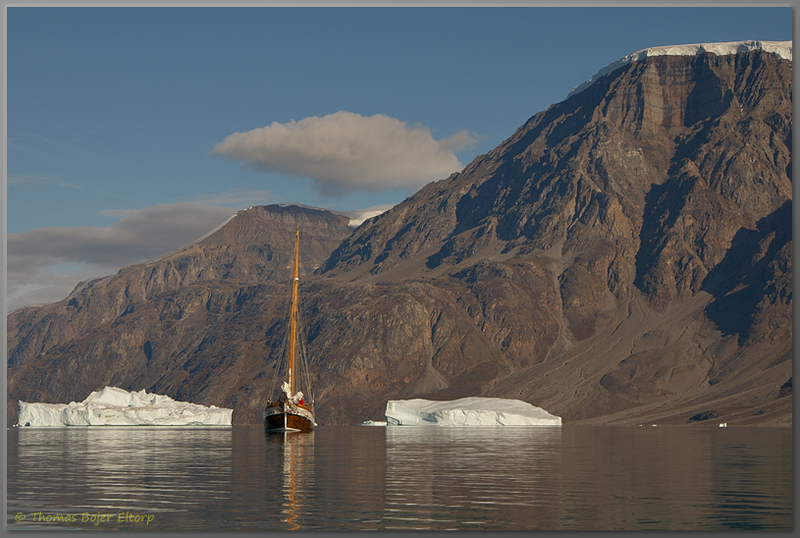 Now awake I decide to take in the early morning views of “Calm Glacier”, “Love Mountain” and the other beautiful sights as we are slowly making our way towards “Island Fiord”. We make a short roundabout Hare Fiord to see if we should be in luck and spot a Musk Ox on our way. Unfortunately we do not, but it is hunting season and that makes it unlikely to see wildlife from the boat. 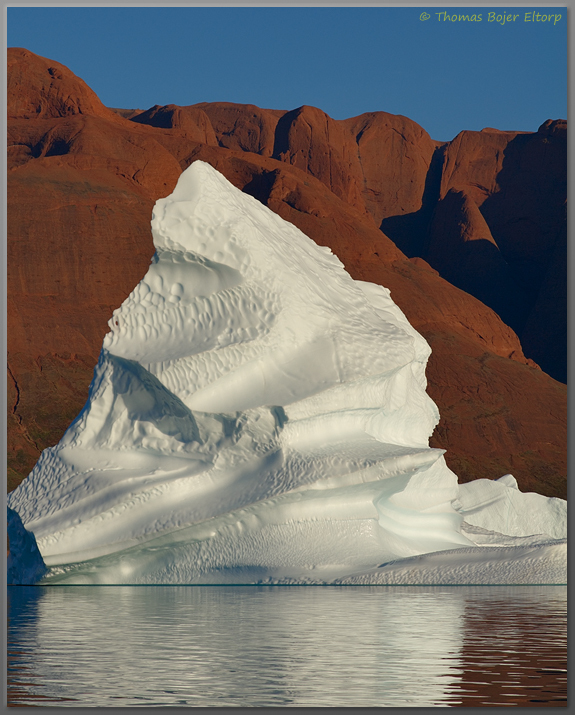 Island Fiord is known for its icebergs and tall vertical mountain sides with dagger like peaks. Our breaths are literally taken away as we enter the fiord vertical mountain faces with sharp pointy peaks rise from the fiord all the way to the peaks some 2000 meters up. Seeing these huge and nearly endless vertical mountain faces with the fiord and icebergs below and the occasional glacier emptying into the fiord is simply beyond imagination. Doing so from a wood ship running on sails is not making the experience less intriguing. As we think we have seen it all one of the larger chunks of ice decided to do a roll for us, sending a large wave towards us. While slowly recovering from this very scary but stunningly beautiful phenomenon, we have finally l earned why Island Fiord is regarded one of the most beautiful areas in Greenland. Another Highlight on our Journey through Island Fiord is a mountain called Grundtvig’s Church, a mountain with a peak shaped just like the Danish Church it is named from and the shape of the peak really seems to match the church. 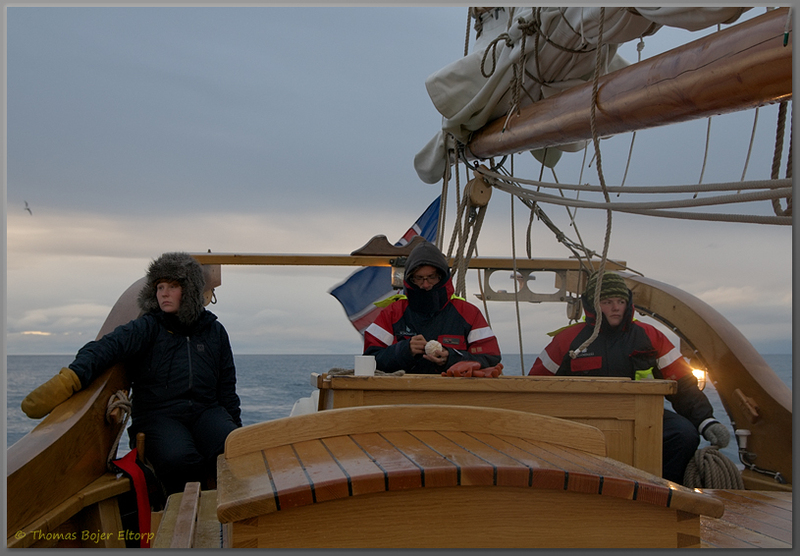 We do another Zodiac trip, to get images of the Hildur at full sails with Grundtvig’s Church in the background. While the swells made shooting a little difficult, it was some rewarding images that came out of it. Close to evening we arrive at Bear Islands and Jytte’s Harbour, another stunningly beautiful natural harbour with quite water and beautifully shaped mountains and rocks surrounding it. I join a few other crew members to board a lonely motor boat anchored up, to confirm if it is the one missing from Ittoqqortoormiit. Everything down to the engine failure seems to match and a satellite phone call confirms that it is the right boat and we decided to tow it with us for the remained of the trip and hopefully the owner will be glad to see it in good shape again. As we got back onboard the captain ordered a crewmember to chip some ice off one of the ice flakes after realising that hauling even a tiny ice flake on board would require a crane. Chopped up a little we enjoy a shot of whiskey on Greenlandic Inland Ice. Soon after the barbeque is on again and another round of very tasty Icelandic Lamb Chops and sausages is on the menu, along with fried rice and salad, add an Icelandic Lager and the menu seems perfect after a long day of sailing and amazing experiences. 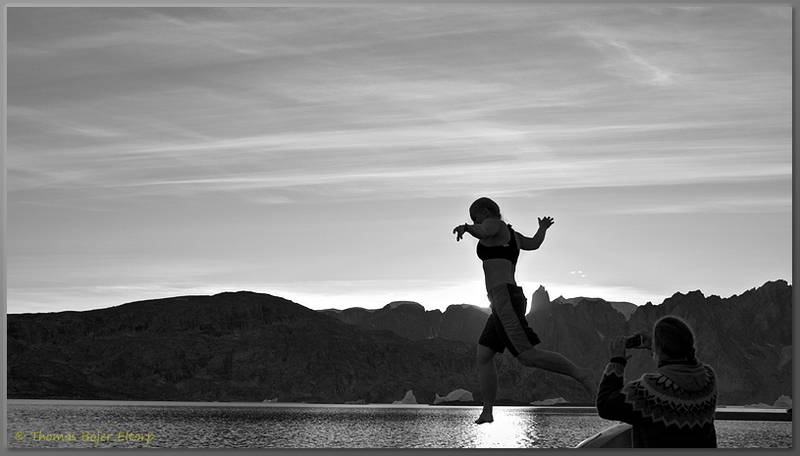 As the sun begins to set the crew decides to go for a swim in the fiord the 4 degree cold water seems of little importance and everybody enjoys the swim in very brisk fiord. A little later we stand on the deck and takes in the view of the full moon rising over Bear Islands, what an amazing moonrise it was. The moonrise mark that it once again is time for bed and we all hit the bunk thoroughly tired after another long and amazing day at sea. It is a very foggy morning, luckily it seems to dissolve a bit during breakfast, after which Captain Heimir dives to free the stuck anchor of the small motorboat. 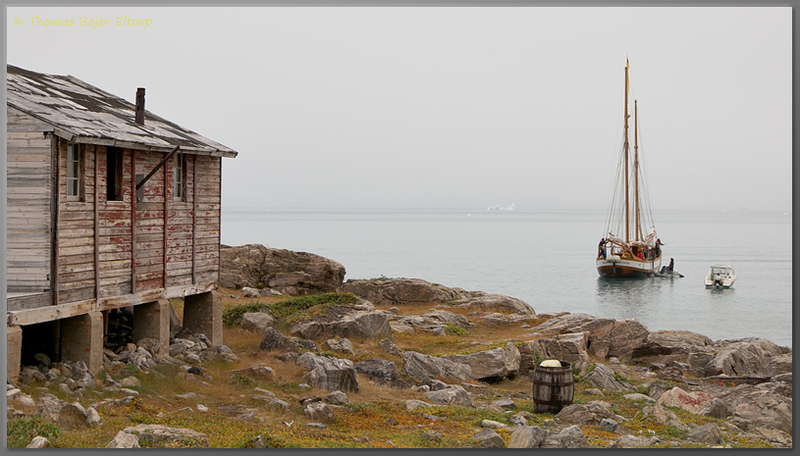 As soon as it has been freed, weighted down and tied to the Hildur we set out on the long trip from the Bear Islands to South Cape, a small hunting cabin on the very border of the National park. 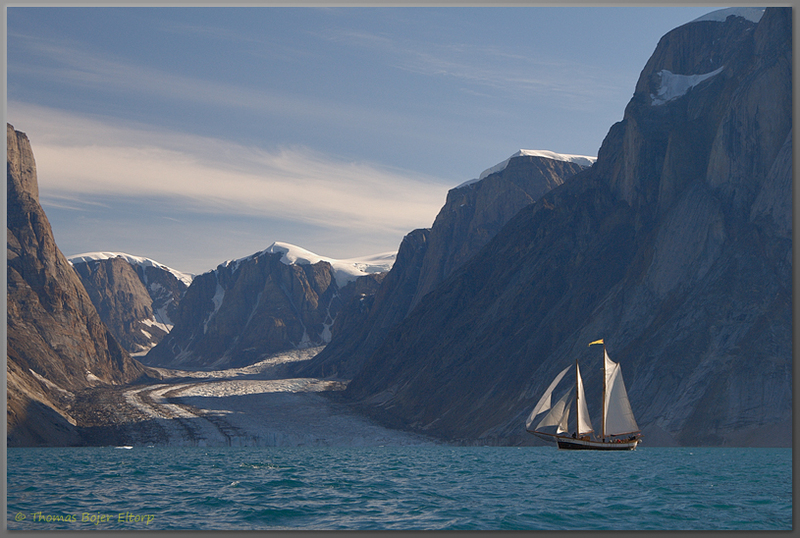 A long sail among some of the biggest icebergs Ittoqqortoormiit fiord has to offer. Bad news is that as soon as we clear Jytte’s Harbour we sail in a wonderful mix of mountains icebergs and small fog banks. 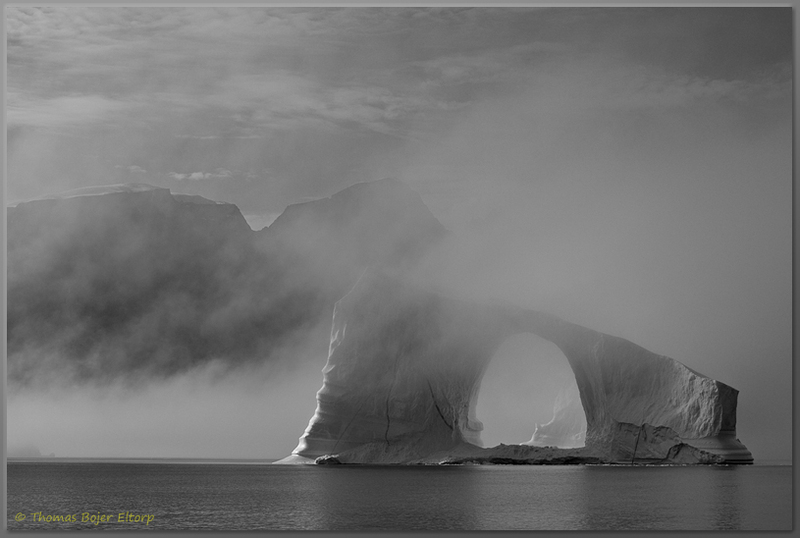 An iceberg with a giant arch sails by and really makes for a visual treat unlike anything I have ever seen before. Nothing short of a visual masterpiece, as only Mother Nature is able to create them. 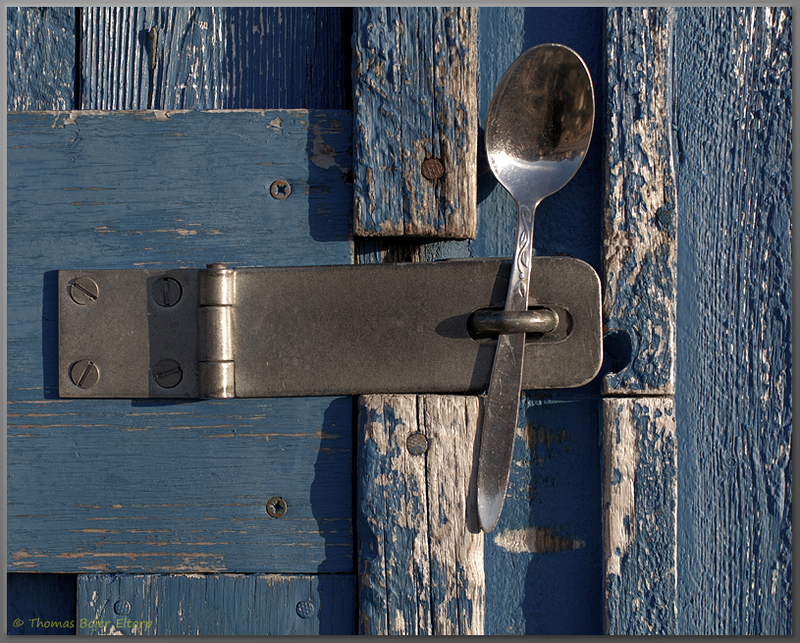 I came away with at least a couple of compositions that will be ready for gallery print of the rapidly changing scene. 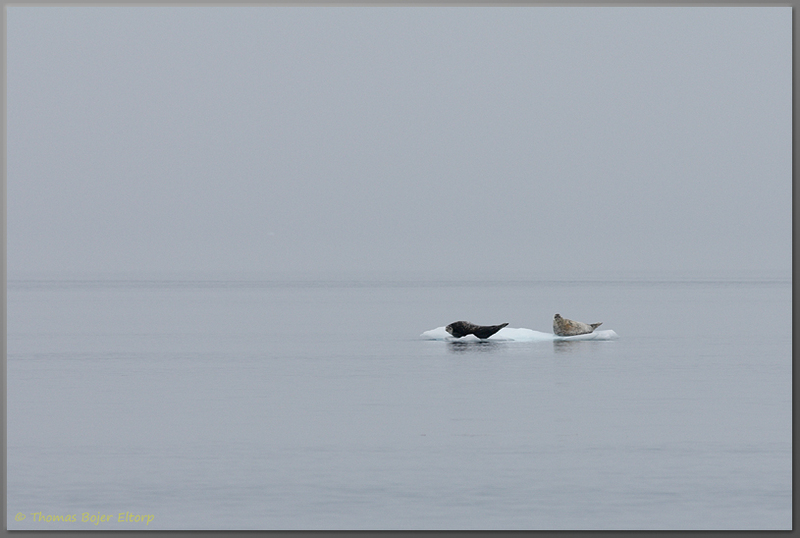 A couple of seals was spotted on an ice flake, they seemed quite lazy and content, however as we closed in they decided to leave the scene well before we got anywhere near them, seals are quite shy animals in the wild. Especially as they are hunted animals up here and while a little too strong in taste for my liking they are popular among locals and often used in soups. Seal meat are also commonly used to feed sled dogs during winter, while the fur is used for clothing as well as the female traditional ceremonial dresses. Soon after the seals the fog closed in and visibility turned from excellent to 10 meters in an instant, thus our cruising speed was cut down to a crawl. One would not want to hit an island sized iceberg without knowing it and they are easily able to hide in the fog. Ice lookouts were posted on either side of the ship and we spend the next 6 hours crawling our way towards South Cape. The arrival at south cape was spooky in its own way the coastline and an old and haunted looking hut slowly emerged from the fog. Immediately behind the hut, a steep mountain wall rose. It looked like the hut was sitting on a small ledge at sea level and if I were to believe in ghosts, thus hut would surely be one of the places they could easily be living. A while further down the cost a much never hut has been build, right next to another haunted looking hut, with a wall missing and everything. It was extremely interesting to enter the hut and read the remarks and stories written, by past visitors. Hunters and adventurers alike has been using the hut for layovers both summer and winter and the interior shows that while it looks well maintained on the outside it can easily have been around for 50 years or more. We use a couple of hours exploring the very foggy south cape, before heading out to the boat again and enjoy an extremely delicious last evening of the cruise meal, A crew member plays guitar while a few of the others sings the most beautiful Icelandic hymns and it feels like an amazing evening to round off a wonderful cruise. 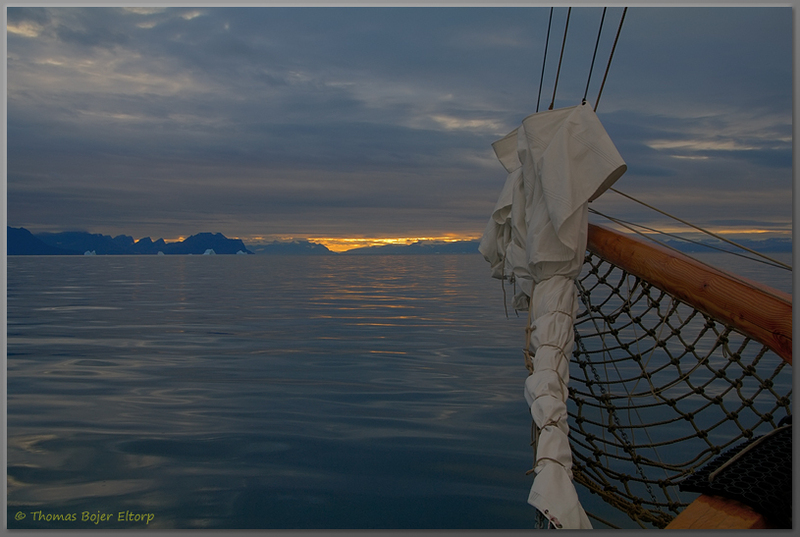 At 2200 hrs the Hildur sets sail for the very long journey towards Ittoqqortoormiit. At midnight I start my 4 hour ice watch in the stern of the boat. I have the pleasure of guarding the darkest and thus fairly dangerous hours until 0400 hrs. 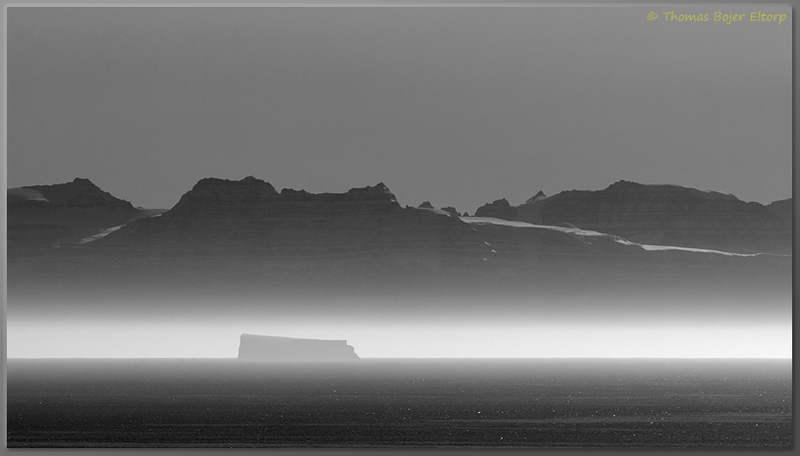 It is chilly 4 hours with increasingly rough weather and icebergs that slowly get more and more difficult to spot as the evening turns to foggy night. Not hiccups and the one skyscraper sized iceberg that popped out of nowhere we managed to steer clear of. At 0400 hrs I am ready for bed and literally hit the bunk sleeping. What a spooky and amazing day and night it has been. Woke up at around 0900 hrs only to find out that weather is poor and that we have a strong headwind and big waves coming in from the front. The excellent Icelandic stew served for breakfast really was welcome positive addition to the day. In many ways it is a race against time and poor weather, because 3 of the crew members needs to catch a plane to Iceland in order to make room for a skeleton crew to run the ship on its journey back to Iceland. Not to mention that Ruth, Louise and I would very much like to get off in Ittoqqortoormiit, we do not have a plane to catch though:) thus our schedule is not under pressure in any way. I Spend most of the time in the bunk, catching up on the sleep I did not get during the night, as does anyone but the crew needed to run the ship on its engines. An hour from the Settlement we realise that we will not arrive in time for the airplane and a high powered motorboat arrives to take the 3 crew members to the airplane. An hour later we arrive in Ittoqqortoormiit and we say our goodbyes, exchange business cards and greetings. An amazing cruise has come to an end and we are so full of impressions and feelings from the trip that it is har to imagine that we are only halfway through the adventurous journey on the Greenlandic East Coast. We walk straight to the Nanu Travel Office for a chat with Karina and Martin about the rest of our stay and fine tune the plans. After a long chat about the cruise and our experiences we start the planning. We decided on a hiking day in the local area the following day, a boat trip to Cape Tobin on the Friday, along with dinner at Therecie and Eric’s place, followed by a visit to the see the local bar. 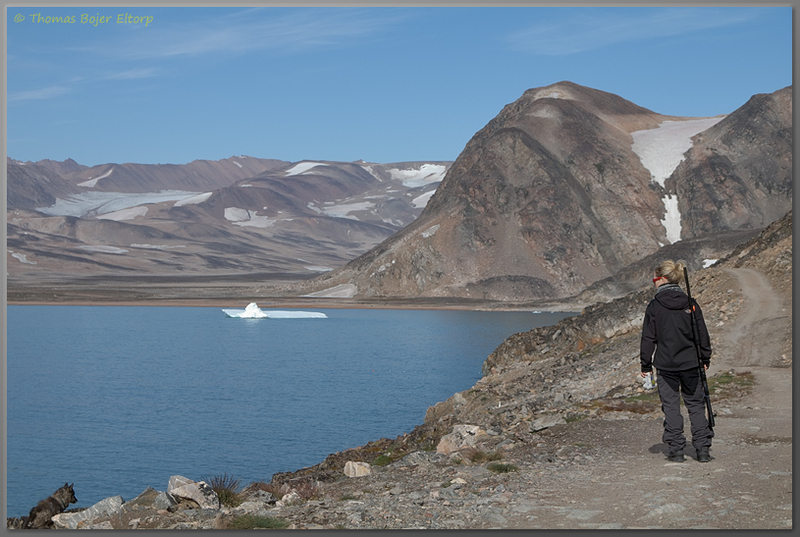 The weekend will be with hiking on the Saturday and a boat trip to Cape Brewster on the south side of the fiord on the Sunday. Monday we will jump on a boat to Nerlerit Inaat and spend two days hiking in Jamieson Land out of Nerlerit Inaat. Only uncertainty to be ironed out is the cancellation of the Helicopter flight we had originally booked from Ittoqqortoormiit to Nerlerit Inaat, but a phone call to Air Greenland the following day should be enough to settle the matter. We are both very pleased to have the rest of the stay planned out and after having enjoyed a stunning moonrise and sunset in one, we swiftly walk towards the gust house and the awaiting shower. Words cannot describe how good a shower feels after five days of adventure and after the show and a quick dinner we have the pleasure of enjoying a wonderful moonrise before go to sleep in big warm bed, another very nice experience after 5 days on a wooden bunk with barely any mattress. While Louise prepares a grand breakfast of hot müsli stew and sweet Chilli tea, I make a couple of calls to make sure that the flight can be cancelled. It turns out that it can and that we can confirm plan for the rest of the stay with Nanu Travel. The news makes for a cheerful breakfast or brunch actually as we are close to noon. A shower and some clothes later we are on our way to Nanu Travel to confirm our plans for the stay. Karina is quite happy that we now have a plan and even let us bring the rented shotgun with us to constable point. We just have to put it on a helicopter back to Nanu Travel before we board the flight to Reykjavik. A quick stop at the Supermarket to buy what we need for a musk ox soup for dinner, in this particular case, onion, rice and potatoes (they have no carrots here) along with a Heineken to supplement dinner. Dinner is going to be a real treat on this fine Thursday. Back at the guesthouse we pack up the camera bag, with camera gear, thermos with hot chilli tea and a snack. The objective of the afternoon hike is to see the ruins of an American World War II weather station and to take a look at the boulder field we will have to cross on the hike planned for Saturday. 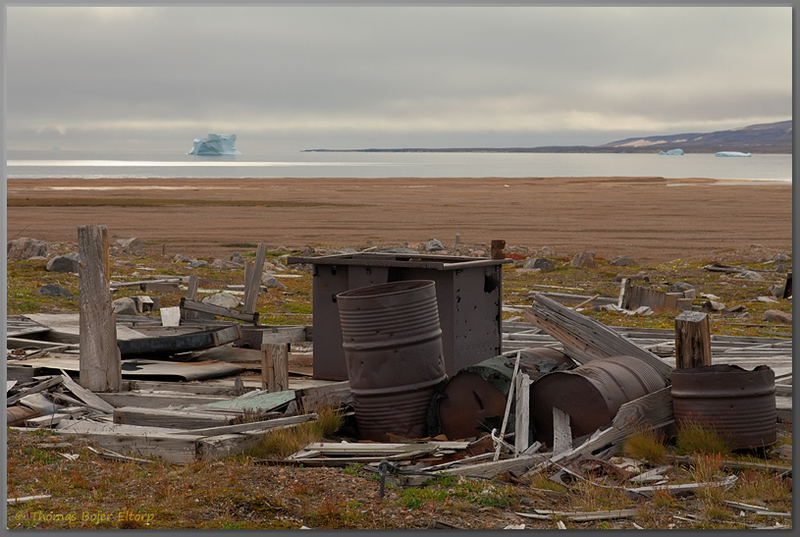 The ATV track towards Walrus Bay is familiar by now, as is the habit of loading the shotgun as we walk out of the settlement. As we reach Walrus Bay, we follow a sketchy trail of weatherworn wood and rusted up junk towards the site of the old American weather station. I am a bit put off by the amount of old rusted up steel junk lying around and as we get close to the weather station things only gets worse. By the time we arrive, I am down right upset by the mess left behind. The old weathered wood I can handle, but a huge amount of old steel rusted up steel junk of all sorts including a vast amount of gasoline barrels, an old stove and a heating oven, just left here to rust up and pollute some of the most serene nature I have ever seen. Why can’t people just take out their trash when they decide to go home? It makes me wonder if they have poured out huge amount of gasoline in the small ponds and lakes to kill mosquitoes, as it has been done in Kangerlussuaq, polluting large areas of the fragile arctic environment. However if you are able to get over the issues above it is an interesting area to visit. And makes for a look into how life was in the area around World War II. From there we walk along side the front of Gull Mountain, past a small lake and into one of the rougher boulder fields I have seen in a while. After a good bit of walking around in there, weather seems to get worse and the clouds starts to engulf the mountains around us, why we decide to have seen enough to time the hike planned for Saturday. We slowly walks out towards Walrus bay again, as we enter the bay we find a nice rock, that looks almost purpose made the two of us to sit down and enjoy a nice cup of sweet chilli tea and a snack. From there it is the familiar walk along the ATV trail to the Settlement, unloading the shotgun and the last wlak to the guesthouse to prepare a delicious musk ox soup for dinner. From there we walk to the small harbour and wait for Marius, Theracie’s son in law, to pick us up in his 19 foot (115 hp) open motorboat. Once onboard we roar out towards Cape Tobin. A closed down settlement now used as a summer house area by some of the wealthier locals. The pier at Cape Tobin is heavily damaged, an old crane only held in place by supportive strings rests on the battered up pier. We jump to shore and enjoy a longish walk in this ghost town, it is a scary mix of summer residences and weathered down ghost houses no long used by anyone. Junk, bones from hunted animals and garbage are all over the place, and if it was not for all the junk and Garbage, this closed down settlement would be a pearl of a place. It has a location to die for at the mouth of the world largest fiord, with an astonishing view to the glacier cut mountains on the south shore of the fiord. I can even imagine that it still looks absolutely amazing during winter where all the junk and garbage are hidden in the snow. Cape Tobin is still an interesting place I think and it will be on my list for the next visit too. From Cape Tobin we set course towards the ocean side of the fiord and sailed our way up the Northern Shore of Liverpool Land. On this shore sits Cape Swainson. 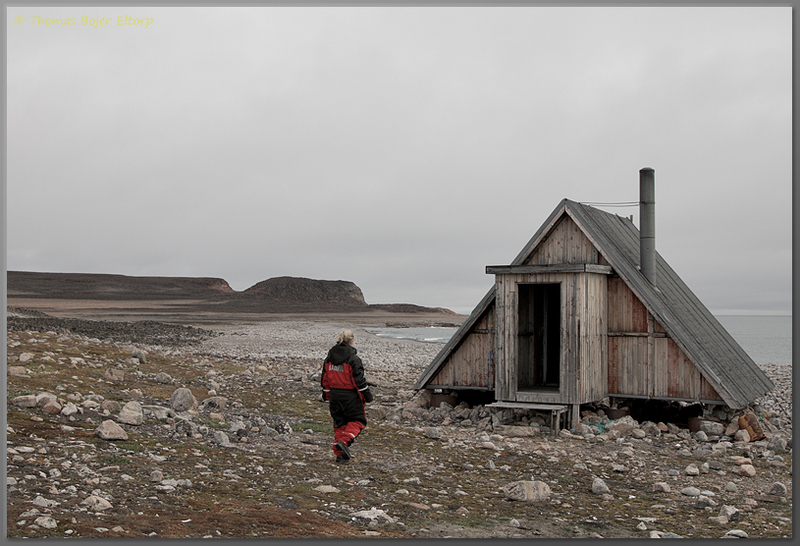 Cape Swainson is really nothing more than two Hunter cabins sitting on a pebbled beach of the weather worn east Greenlandic Shore, the location is rough, perhaps the roughest I have seen. The hardwearing mountain coast looks battered by iceand water as does the huts, but the area is surprisingly enough clean, save for a huge amount of bones from hunted and cooked animals. I can imagine this as a most amazing dogsledding location during winter. When we come back during winter, we will definitely be visiting Cape Swainson again, it has a very promising winter location. From here we continued the tour of the ocean shore line the hard wearing mountains looks battered and bruised from battling the tough arctic climate, but it makes for a start impression of how tough this environment really is and how tough the locals must be to live here all year. We hunt for seals for a while, but our boat driver and local hunting chairman miss the two seals we see, shooting seals from a moving boat in moderate high waves is difficult I can imagine, thus we decide to sail into the fiord where the water is calmer. We are in awe and I switch between studying the animal and shooting images as we move in, we are practically within petting distance of this king of the arctic. It seems rather stressed by our appearance and we break of following it a short while after, but seeing this incredible animal in its natural environment is absolutely amazing and very different from visiting a zoo. 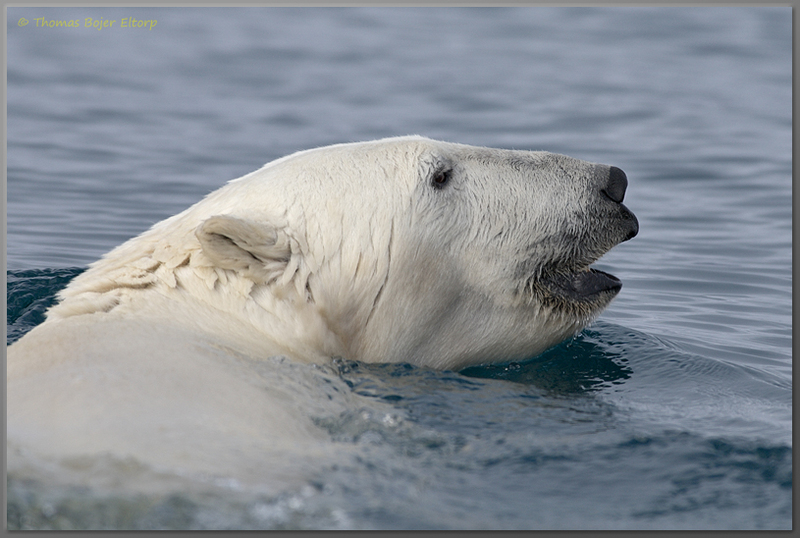 All of the sudden one realises that we are guest in the Kingdom of the Polar Bear and not the other way around. Everybody is high on adrenaline after the encounter and when getting back we talk Polar Bear all the way to the guest house. At the guest house we grab a shower, a cup of sweet chilli tea and a change of clothes, before walking over to Therecie an Eric’s house for dinner. Musk ox and homemade blueberry pie on the menu, both of which can only mean that no one will go hungry from the table. During dinner Therecie and Eric entertains with stories from the area and their own life, including stories from the family and their life. There are extremely openhearted and some of the kindest people I have met on this Journey. Lea (Therecie’s daughter) and her soon to be Husband and our boat driver Marius is here too, as we talk Polar Bear again, Marius and Lea shows us a beautiful winter fur from a Polar Bear. The strong and uniform white fur, with perfect paws, claws and everything is amazing. So is the story about it being shot by Marius to save his own life on the day Lea gave birth to their second child. What is more surprising is that we are offered to buy the fur from them. It is a special fur and they wanted it to have a special home. While money would be exchanged should we decide to agree on it, it was an offer among friends and we are most grateful to be calling this family our friends. We go to the local bar that night and celebrate a most amazing day with a single beer, a Heineken of course. We spend the beer time discussion back and forth whether we would be able to accept to buy a Polar Bear fur. The financial side was easy, but the moral aspects of buying it much more complex and we ended up agreeing to sleep on things and make a decision the following day. When we hit the pillows on this day neither of us can believe what a day it has been. It has probably one of the most adventurous and surprising days for years.